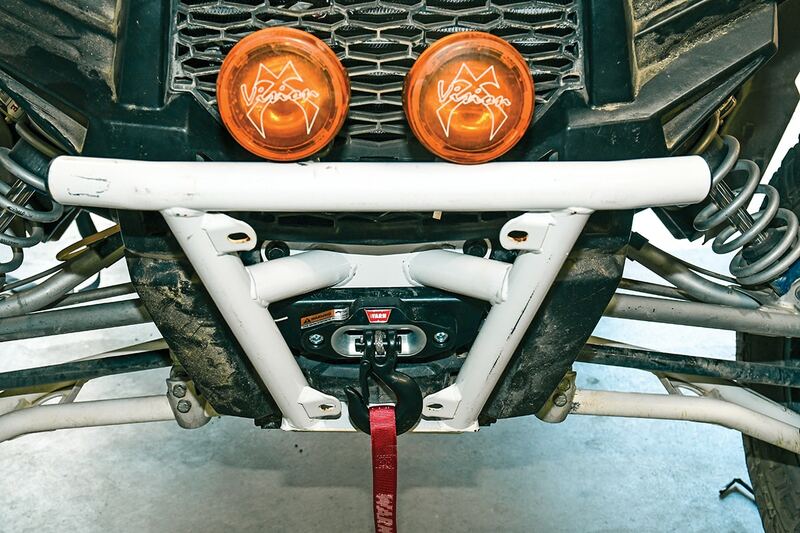 Off-road enthusiasts have long had a theory that their winch should have a capacity of three times the vehicle’s weight. As our UTVs get heavier due to longer suspension, bigger powerplants and more payload capacity, we require winches with more weight capacity. With Warn Industries being the leader in winches, and winches generally being one of the heavier accessories we install, Warn developed the ProVantage 4500-SSD to be high in capacity but also lower in size and weight. At 14.7 pounds and 13.12 x 4.51 x 4.69 inches (L/D/H), the 4500-SSD packs a lot of punch in a small package, and the synthetic rope is also easier on our gloves. 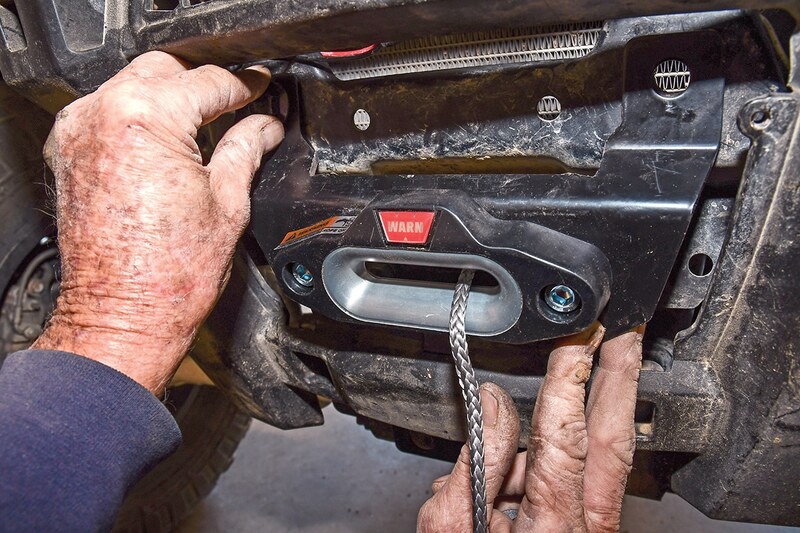 So, we got our grizzled hands on Warn’s latest and greatest UTV winch, the ProVantage 4500-SSD (#98600, $789.99), and installed it in our long-term RZR XP 1000 test machine. 1.) Warn had an impressive booth and display at the recent King of the Hammers. 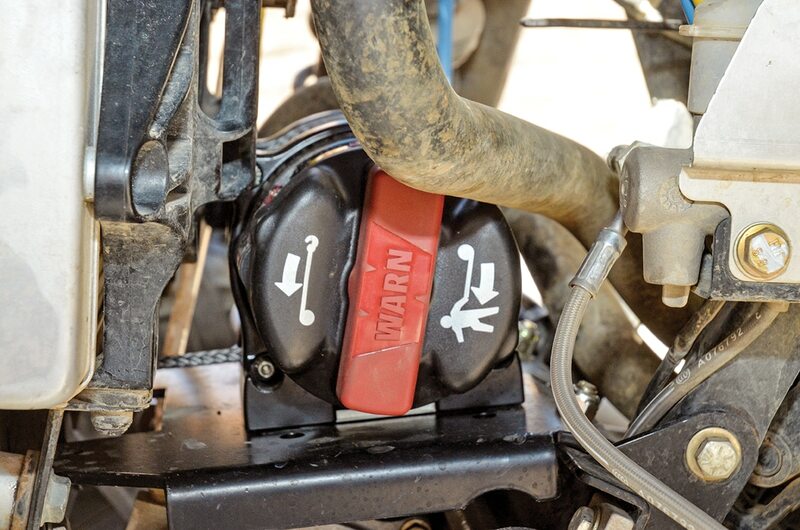 The ProVantage 4500-SSD winch looks great on the Warn Radio Flier wagon. Let’s see if we can squeeze it into our Polaris RZR XP 1000. 2.) For better photos, we jacked up the front-end and removed the left front wheel and shock. We also removed the front bumper. In the winch box, we have everything to wire and install the 4500-SSD. Let’s get to it. 3.) 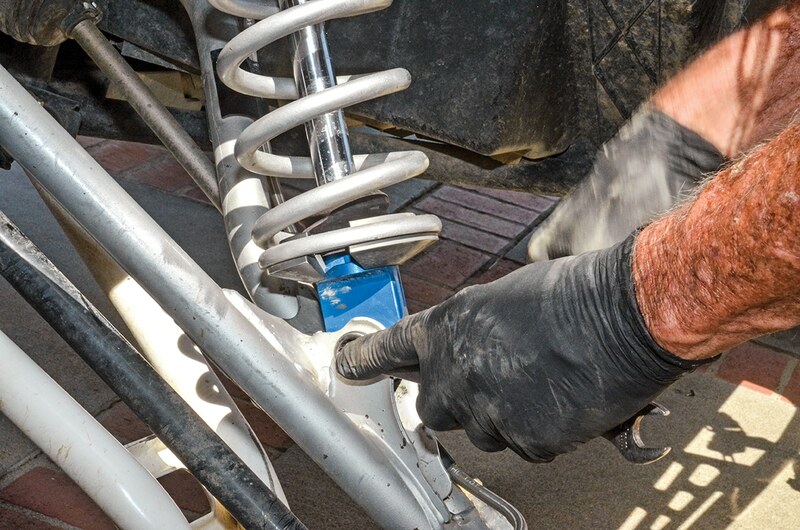 Locate and purchase a mounting plate made for your specific UTV. 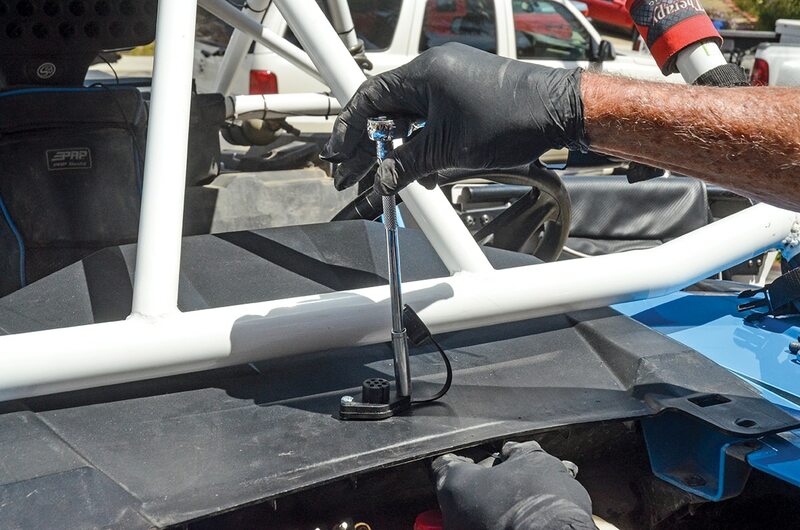 For this installation, we will be mounting the winch in a Polaris XP 1000 with a Shock Therapy front sway bar. We ordered our winch mounting plate from Warn, thinking we would go for strength and not price. 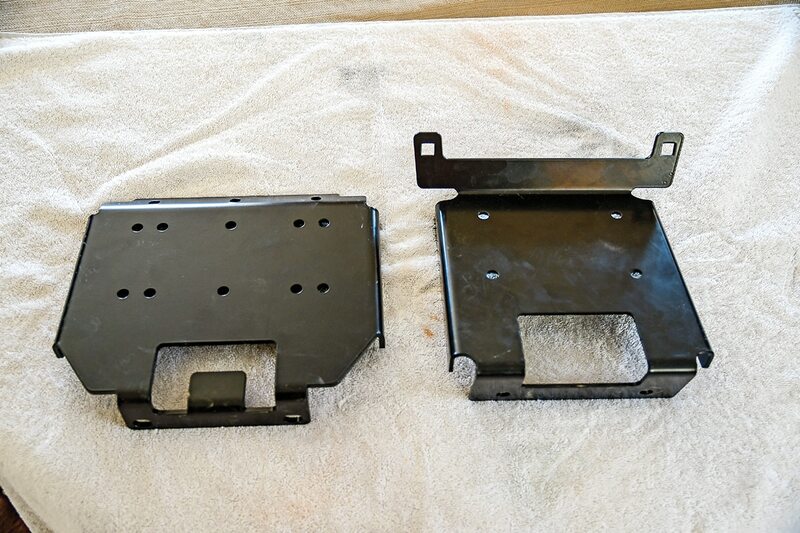 The mounting kit came with two plates and a bag of bolts and nuts that make the job much easier. Install the plate using provided 25mm bolts and Nylock nuts. 4.) Because the area the winch plate goes into is so tight, the use of ratcheting box-end wrenches speeds the job considerably. 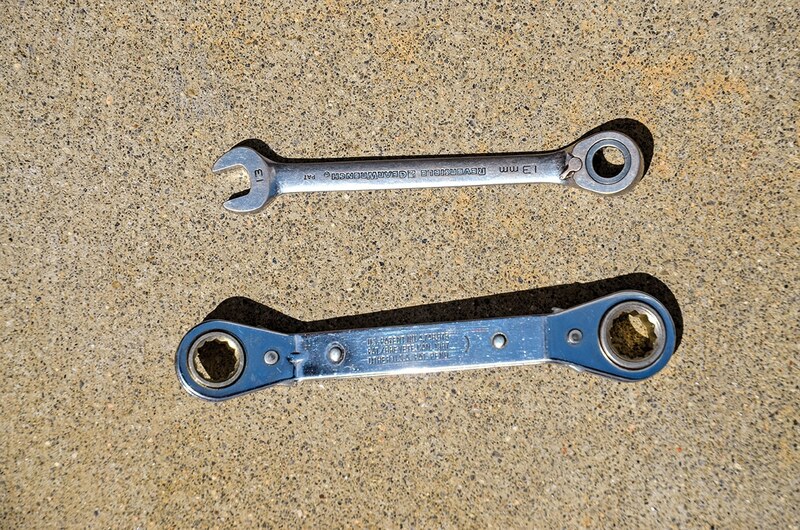 Even with the speed wrenches, this was the most time-consuming step. 5.) Remove the seats and, if equipped, harnesses. Removing the center console is easy. 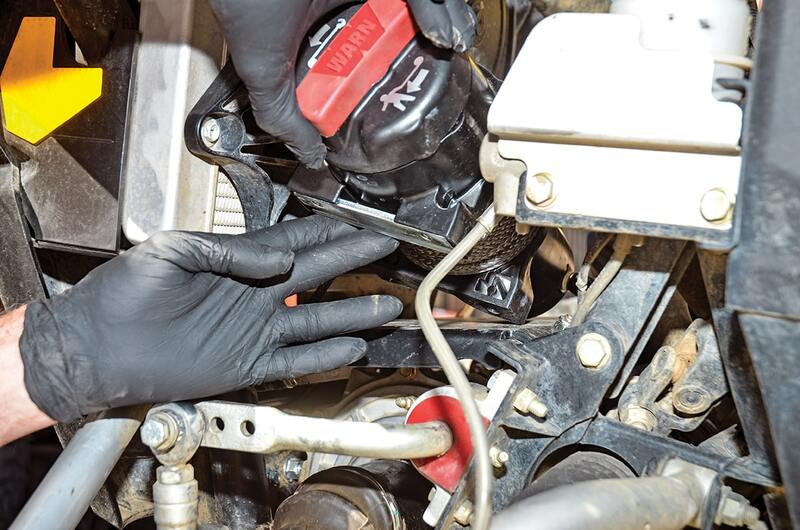 Remove three screws and four pushpins, and unseat the rubber shifter boot. 6.) 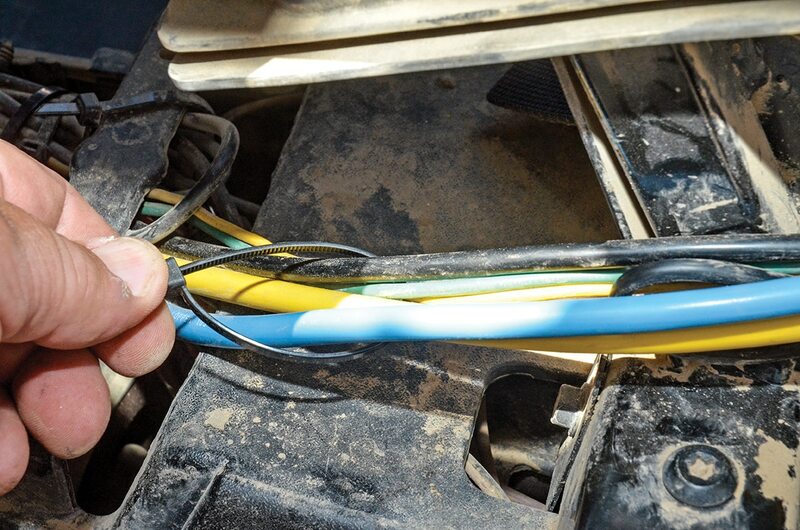 The electric wiring is a snap, as the Warn wiring is color-coded. Warn recommends mounting the contactor as close to the battery as possible. 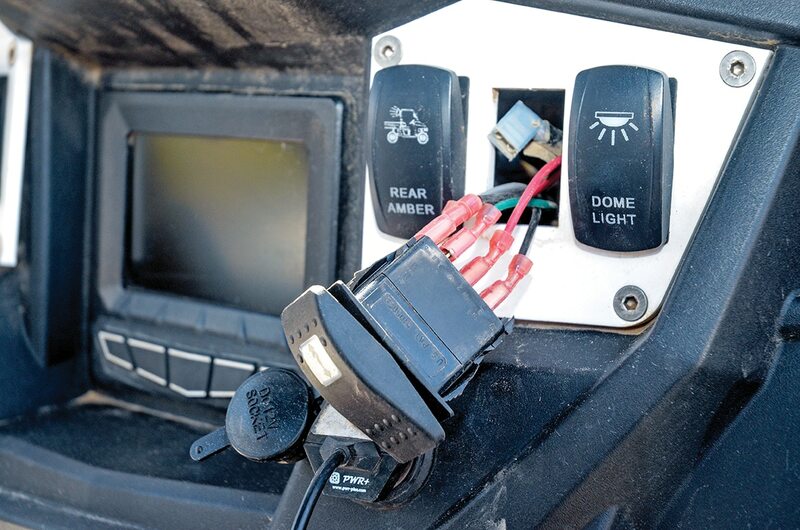 On RZR XPs, remove the two bolts holding the voltage regulator and replace them with 40mm #6 bolts. Mount the contactor on the longer bolts. It’s a perfect fit, very close to the battery and out of the way of the seat. 7.) Run the blue and yellow six-gauge cables and yellow/green control wires to the front of the car. The black and red cables go to the battery to be hooked up later. The kit comes with a molded rubber plug for the remote control, and all the wiring you will need is in the two harnesses. 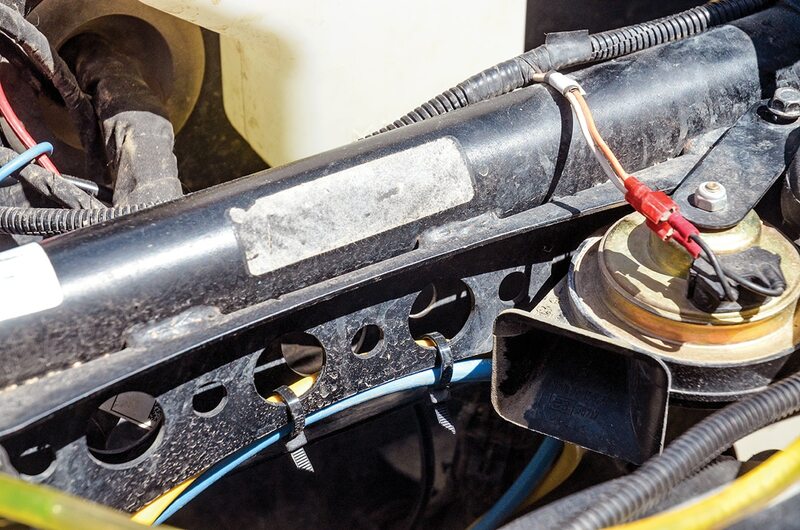 Once the Warn wires are in place, zip-tie them so they won’t make contact with the drive shaft or be pinched or chafed by bodywork. 8.) The short harness goes to the rocker switch (included); everything is color-coded, so you can’t go wrong. The wiring instructions are very clear and make it a snap to wire the switch and contactor. We wish the harness was longer for the rocker switch. Install the rocker and snap it into place in the dash. 9.) Use a 7/8-inch hole saw to drill the hole for the remote plug. We mounted the plug on the dash panel and ran the wires to the rocker switch and down through the console to the contactor. Plug in and zip-tie the wiring in place. 10.) Drill two 1/4-inch holes to mount the remote socket to the bodywork. Tighten and replace the dash-panel fasteners. 11.) Get the winch ready to mount by attaching the blue and yellow cables, and remove the rope-retainer band. Slide the winch onto its mounting plate. 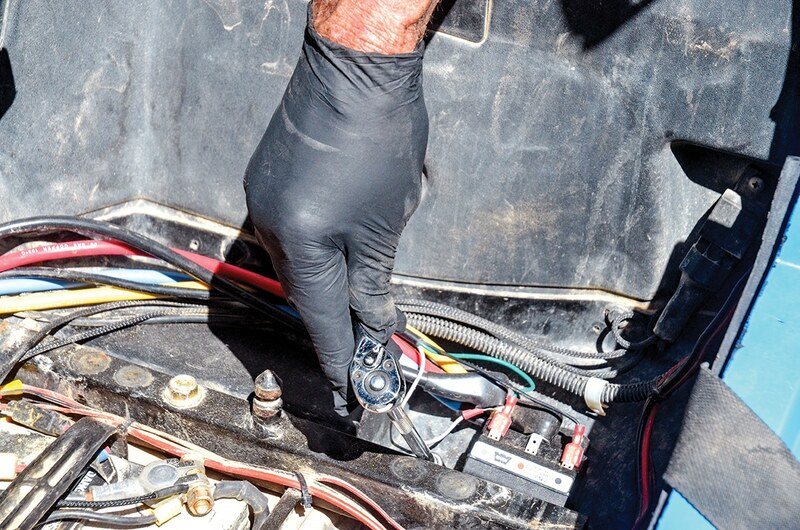 This is made easier by hooking the radiator hose over the brake reservoir on the RZR XP. The M8-1.25 8.8 bolts come up through the bottom; start all four before tightening. 12.) 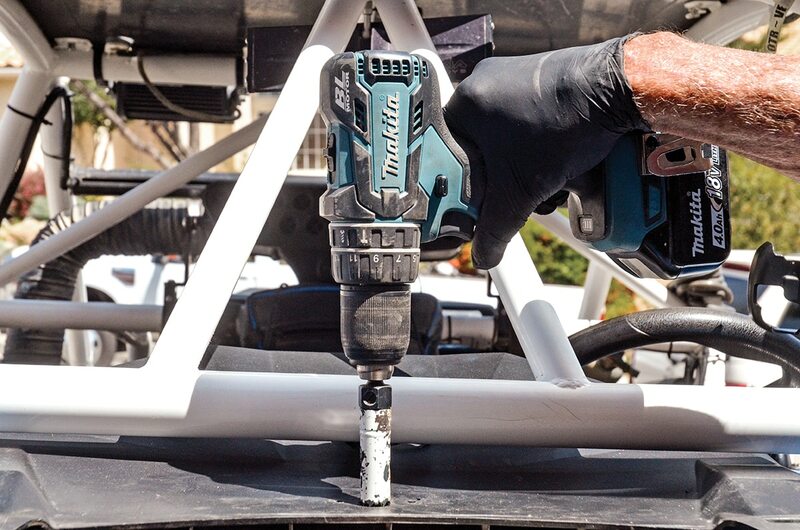 Torque the winch-mount bolts to 12 foot-pounds. 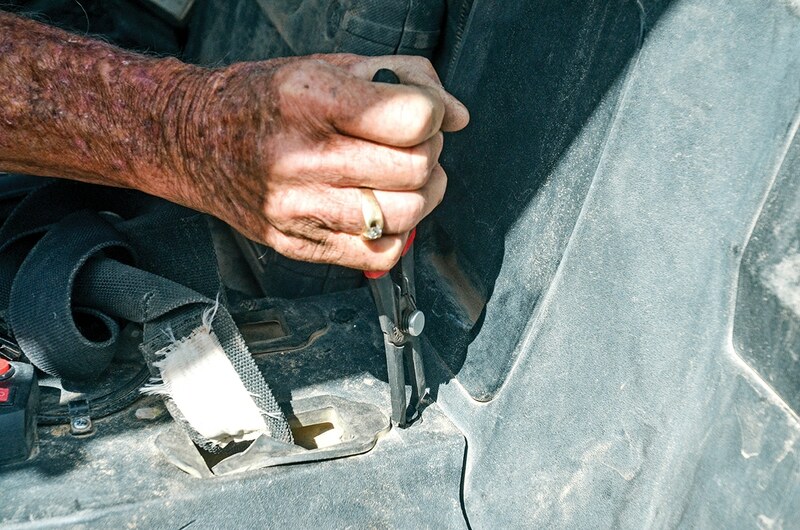 Remove the front plastic for easier access to the front differential area. 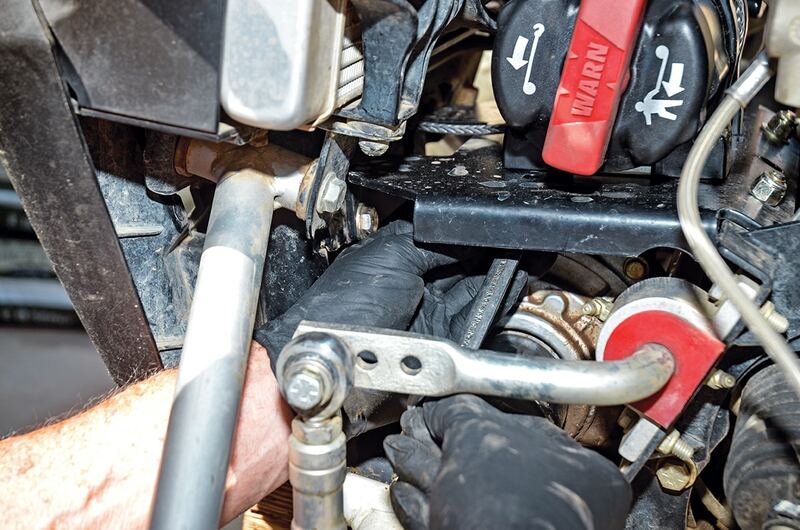 Slide the winch fairlead mounting plate in place over the diff and use the stove bolts. It makes bolting the plate much easier. Slide the winch in and line up the mounting holes (the 4500-SSD has the same mounting holes as the 3500 winch). 13.) The Hawse fairlead mounting plate installs on the front where the bumper bolts on. Use the big bolts that come in the kit. It made a good, stiff mount for the bumper. We ran the rope through the Hawse fairlead and installed the hook. 14.) We also zip-tied the winch power cables to the shock-tower gusset for a clean install and less risk of worn wires causing a short. Go to www.warn.com to view the installation instructions, with wiring schematics in English, French, Spanish and German. 15.) We replaced the front shock and tire, and buttoned up the console and other bodywork. Reinstall the front plastic, hook up the red and black battery cables, install the seats, and let’s go look for a place to get stuck! 16.) 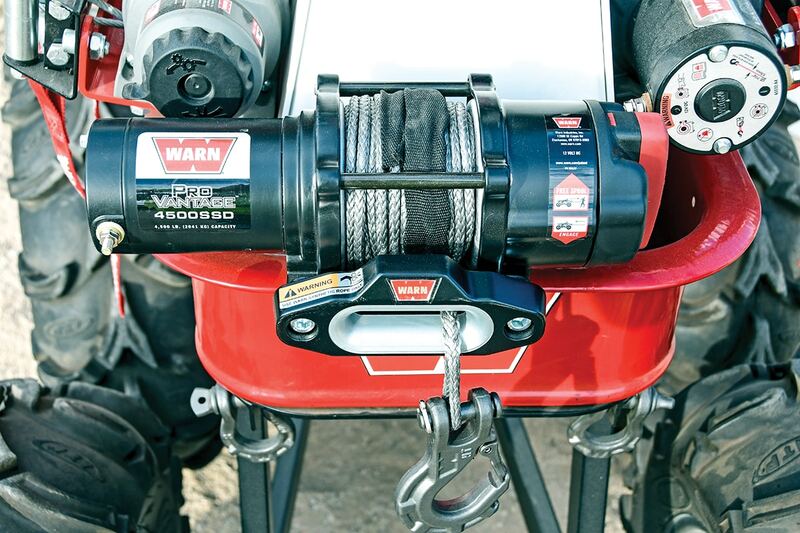 Besides the dash toggle and remote control, the Warn 4500-SSD has a cool ergonomic clutch handle for manually reeling out the 50 feet of synthetic rope. Click the red handle clockwise to release the roller disc brake.